The most amazing thing about the skeletons in our Dinosaurs in Their Time exhibit is that the majority of their bones are the real deal. The second most amazing thing about those skeletons is that whenever a bone was missing, someone had to create a cast of that bone from scratch. Dan Pickering is one of those craftsman. Dan, whose been part of the museum’s PaleoLab team since 2005, is an artist, a sculptor by training. 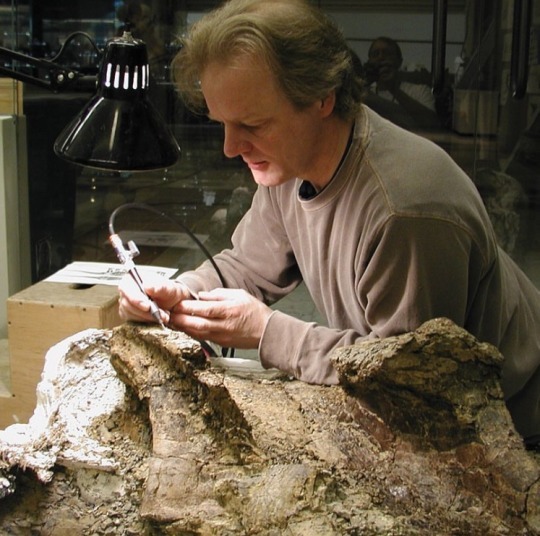 Pictured above: Dan preparing a giant neck vertebrae of Dreadnoughtus, a super-massive dinosaur from Patagonia excavated and studied by museum dinosaur hunter Matt Lamanna and colleagues.